"He was perched with one knee drawn up, chin resting on his arms. He looked totally relaxed...and I suddenly realized this was how Superman would sit. He wouldn't puff out his chest or posture heroically, he would be totally chilled. If nothing can hurt you, you can afford to be cool. A man like Superman would never have to tense against the cold; never have to flinch in the face of a blow. He would be completely laid back, un-tense. 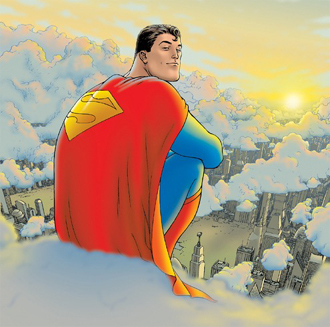 With this image of Superman relaxing on a cloud looking out for us all in my head, I rushed back to my hotel room and filled dozens of pages of my notebook with notes and drawings." —Grant Morrison, on his meeting with Superman. All-Star: The concept behind All-Stars is to get the hottest, fan-friendliest writers and artists to do their interpretations of classic DC characters in their classic scenarios, free of the restraints of current post-Crisis continuities. If you haven't read DC books in years, you'll immediately feel comfortable with All-Star books. At the same time, these books will look and feel like 2005 publications. All-Star is not about continuity—it's about about telling new stories for a very different audience we've got now because they're reading manga and adults are looking at superhero movies. Frank and I are keeping modern sensibilities in mind while trying to make sure that each of our stories addresses some basic human fear or need in a big, colorful, comic book way. We hope to produce a collection of science fiction folk tales with Superman at the heart of them. I like to think of these stories as 'relevant' to the human condition although not necessarily relevant to the current headlines, if you see what I mean. The All-Star Superman is intended to appeal to a wide audience of diverse people for a long time, like the Greek myths. We're using the leeway the All-Star concept gives us to take the best elements from every era of Superman and use them to build a whole new world and direction for the character. I'm certainly looking at this as my definitive statement. After Superman, I have no mainstream comics work lined up. Dan wanted this to be 'Original' Superman, 'Classic' Superman basically—more like a movie or the animated version where the set-ups are the familiar ones most people know—i.e. Lois doesn't realize Clark is Superman, Jimmy Olsen is a cub reporter etc. 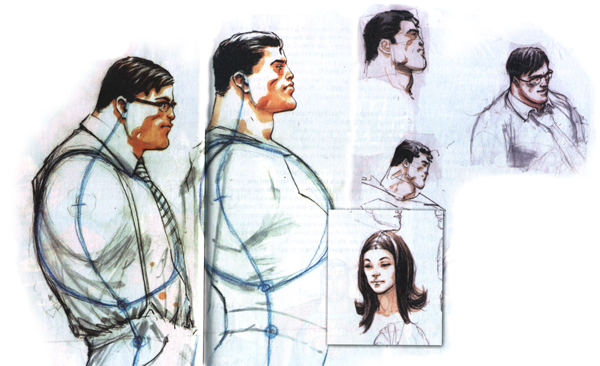 Back in 1999, however, one of the lynchpins of my Superman 2000 pitch was to make the married Superman scenario work as well as the previous Lois/Clark/Superman triangle had. Mark Waid and I argued over this at length, believe me, with Waid—that arch iconcoclast—coming down, for a change, on the side of tradition. With All-Star Superman, I think I've come up with a whole new approach to the Lois, Clark and Superman too relationship, so I'll leave it at that until you see how it plays out in the books. We deal with the entire origin sequence using four panels on page one of our first issue, in a way I think fans will find amusing. My only rule with Superman is that he does not kill. That's the essential core. He always finds a way to solve every single problem without anyone being hurt. There are a few little bits and pieces left over from the aborted Superman 2000 pitch which I came up with but this is something new and most of this material was put together over the last two years. My comics tend to be inspired by whatever's going on in my life and in the world at the time and Superman is no exception. Comic books have changed and my ideas are constantly evolving and changing with the times. The best Superman idea I ever had, I gave to Mark Millar for the conclusion of Red Son, so I've been forced to try even harder to do something even better here. The first issue "Faster..." starts with Superman attempting to rescue the first manned spaced mission to the sun. Some astronauts have tried to land, so he has to go rescue them. His solar cells become super charged by an overdose of solar radiation. They're designed to absorb solar radiation, but this time, because of the amount and the proximity, he's overdone it. There is a fatal chain reaction in his cell structure and his cells begin to self-destruct. He finds out he has a year to live. P.R.O.J.E.C.T. specialists race to create a new Superman. The whole thing starts with Superman: "Okay, what do I do now"? It's a big science fiction story about Superman's death and what he'd do if he thought he was dying. It's also Luthor's biggest scheme—he's in prison in the first issue, and that's exactly where he wants to be. It's all worked out, there are lots of twists and turns. The first issue ends with Superman revealing his identity to Lois and the second one has this take on the Lois and Clark relationship that no one has ever done before. Issue #2 is the 'Lois-Lane-in-the-Fortress' issue of All-Star. It's the Lois we all love—shrewd, witty, romantic, tough...and obsessively trying to crack the secrets of Superman's civilian identity. The Fortress is stuffed with a ton of new toys and gets haunted by the bandaged ghost of the Unknown Superman of 4500 AD. The Kandorians finally get out of that bottle. Superman gets a new power. Issue #3 is 'Lois Lane--Superwoman!' so dig it. Lois is a complex and fascinating character, that's all I'll say until the book comes out. Clark Kent winds up sharing a prison cell with Lex Luthor in issue #5. The Bizarro Cube Earth invades our world in an epic 2-part adventure (no 'decompression' here!) and we're recasting the Bizarros as a frightening, unstoppable zombie-plague style menace. The Bizarros are a lot more predatory in All-Star and their touch is infectious. It's a 'zombie apocalypse' approach to the Bizarro concept and the idea of an unstopable plague of backwards-talking idiocy sweeping across the globe seems ironically amusing right now. Bizarro Jor-El and the Bizarro JLA turn up in the second part of that story too. What else? We meet Earth's replacement Superman and Clark Kent takes on a new superhero identity... Ten of the 12 issues are complete short stories in 22 pages, so lots of stuff happens. 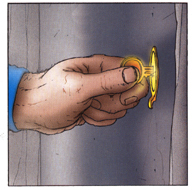 And it all links together as a maxi-arc or whatever they call them these days, entitled 'The 12 Labors of Superman'. In All-Star, Superman doesn't talk much. He just shows up and saves the day and then leaves. He's more like the early Superman in that sense. He saves the day and doesn't give speeches on what's right and wrong. To me, he's a big folk hero. He's been around forever. He's like Paul Bunyan or Johnny Appleseed and here I'm allowed to tell new stories of these amazing folk heroes. You've got to make Superman about a few things. It's got to be about big emotions and big human feelings like death and loss and bereavement and grief and joy. Then you weave those weird sci-fi stories around those themes. I think those are the best Superman stories—the ones about human feelings but on a huge, cosmic, ridiculous, superhero canvas. We're changing his costume slightly...the symbol slightly. And for a small part of it, he won't have those red trunks on. I mean, we all want to see it. We all want to know, "Would he look really cool without the trunks?" No one has ever done Clark Kent to Superman; showing the difference between these two guys. And Frank can do it. He can do the body language in a way you've never seen it. You'll actually see his whole posture change and his paunch disappear and his three chins disappear. This is a complete transformation. This is like Jekyll and Hyde. We've never seen it before in 70 years of Superman. Ma & Pa Kent—one dead. We're going with the version where Pa Kent has died. That's the day Superboy becomes a man. We've got a very different version of Lois. This is a Lois who's been through a lot. Superman's been lying to her for years. When she gets the real story in the first issue, she doesn't necessarily believe what he tells her. It's clearly a different dynamic. Lois and Clark are kind of seen as Katherine Hepburn and Spencer Tracy. Lois likes Clark because he's smart and witty. Even though he's a big farm boy, he knows things; she can talk to him. There are really two Clark Kents. There's Clark on the farm and then Clark acting in Metropolis. The Clark I like is middle-America values and he applies those to morality. There's the new Clark Kent; he's interesting. He's the one I like. The bumbling Clark Kent is Superman acting. Every time he knocks something over he's doing it to save somebody. Superman's pal has to be the coolest guy on Earth. We're doing Olsen as the guy every teenage boy wants to be—smart, fearless, funny, a big hit with the girls, a good loser, a great fighter, an action correspondent on the sexiest newspaper in town and best friend of Superman! Luthor is the part of us that's the most evil, the most human, and the most brilliant. He's never managed to get rid of Superman because deep down he knows that when he does, he'll be forced to prove himself to the world...and be found wanting. This is the subconscious engine that drives his hatred of his nemesis. The rest of Superman's Rogues Gallery is pretty weak, so I've tried to add some characters I think might enhance the mix. Solaris, the Tyrant Sun from the DC 1 Million series gets a makeover and a return visit, and I figured Superman could use a 'Subhuman' counterpart, so I've created Krull, an evolved dinosaur dictator who rules a monstrous civilization at the center of the earth. He's only in the story for a few pages but the concept is strong and feels like one that could be used again. Then there's the Abominable Snowman, a tragic scientist who's a bit like a refrigerated Incredible Hulk and turns up for a couple of pages. Superman needs some good tough monsters to fight, so I've tried to think along those lines. In most cases, the villains only get walk-on roles in this one, however. Overall, the series is more about Superman's relationships with his friends and with the world than anything else. People know my stuff and I'm sure they can guess what to expect. It's going to be big, bold sci-fi Superman for 12 issues.